References m_wAccount, m_wName, m_wOk, newDialogBuilder(), and s_ok_clicked(). References AccountHandler::allowsManualBuddies(), DESC_COLUMN, AbiCollabSessionManager::getAccounts(), AccountHandler::getDescription(), AbiCollabSessionManager::getManager(), m_model, m_wAccount, and UT_UTF8String::utf8_str(). 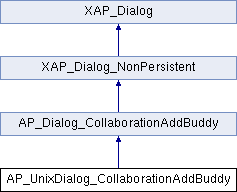 References AP_Dialog_CollaborationAddBuddy::_setName(), HANDLER_COLUMN, m_model, m_pAccount, m_wAccount, m_wName, UT_ASSERT_HARMLESS, and UT_SHOULD_NOT_HAPPEN. References _constructWindow(), _populateWindowData(), abiDestroyWidget(), abiRunModalDialog(), AP_Dialog_CollaborationAddBuddy::m_answer, m_wWindowMain, and UT_return_if_fail. Referenced by _populateWindowData(), and event_Ok(). Referenced by _getActiveAccount(), and event_Ok().